A very special limited edition Mazda RX-8 rotary sports coupe will make a special public appearance at the 2008 Melbourne International Motor Show. A very special limited-edition Mazda RX-8 rotary sports coupe will make its public debut at the Brisbane motor show on February 1. The Mazda RX-8's stated power output is down 7kW to 170kW on six-speed manual models to align with international noise regulations. Mazda's latest edition to its unrivalled sports car line up is a limited edition RX-8. Known as the RX-8 Revelation, it exudes luxury and exclusivity, with the added enticement of only 100 vehicles available in Australia. HIROSHIMA - Mazda Motor Corporation has developed the world's first direct spot joining technology to join steel and aluminum. 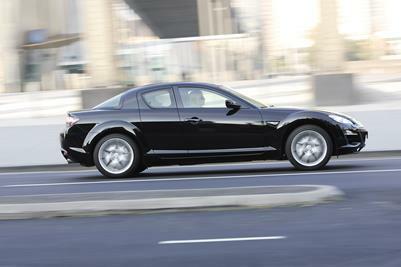 The Mazda RX-8 opens a new chapter in sports car history. Marking the return of rotary power, Mazda's flagship RX-8 is the only sports car to combine great dynamics with centre opening Freestyle Doors and room for four adults.